NASHVILLE — When the buzzer sounded, Jamal Murray had only one place to go: center court, where Murray’s Kentucky teammates viciously swarmed the freshman sharpshooter, knocking him to the ground atop the SEC logo. Confetti sprinkled from the sky in Nashville’s Bridgestone Arena while the Wildcats mobbed one another, a raucous Big Blue crowd egging them on with every passing moment. But soon, the celebration shifted to a bona-fide dance circle. First up: Reserve guard E.J. Floreal, who began gyrating like a well-lubricated groomsman, one who routinely steals the show at wedding receptions. Later, it was Murray’s turn. The freshman offered his own quick before launching into his now-famous celebration: An invisible bow-and-arrow, pulled over his right shoulder and shot directly into the chest of Floreal, who dramatically tumbled backward into a pile of willing Wildcats. The celebration, impromptu as it was, could only be described one way. “It was perfect,” said Kentucky forward Marcus Lee. 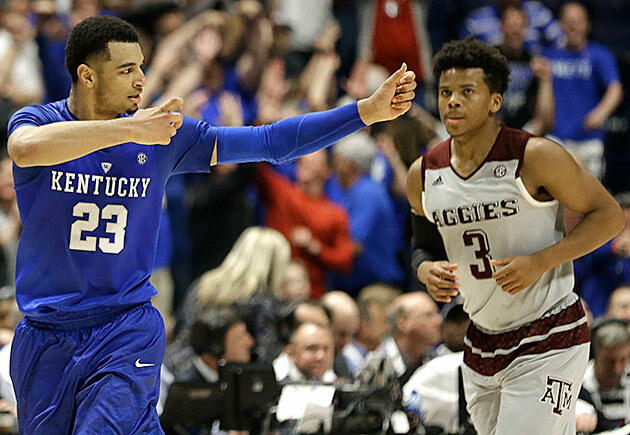 Kentucky deserved a moment to revel after launching an arrow into top-seeded Texas A&M, whom the Wildcats beat 82–77 to win the SEC tournament title on Sunday. The result secured Kentucky’s 29th tournament championship, by far the most of any SEC program. But perfect is a word that has a new meaning to Kentucky this season. Last year, the Cats streaked through their conference bracket and entered Selection Sunday with an unblemished, head-turning 34–0 record. That group’s season, which had been defined by its historical pursuit of perfection, ended in a deflating loss to top-seeded Wisconsin in the Final Four. These Wildcats, however, are not perfect, something head coach John Calipari knows well. But that doesn’t mean Kentucky can’t author a different end result. On Sunday, another SEC title served as a much-needed feather in the Cats’ cap heading into the Big Dance. After an up-and-down season, this Kentucky team has reverted back into the program the rest of the country should fear in March. That fairytale ending almost wasn’t thanks to a stingy and relentless Texas A&M team. The Aggies hit the throttle all day against Kentucky, building a 38–34 lead by halftime despite the Cats hitting 52% of their first-half shots. But Kentucky fought back, and with 4:01 to play Murray splashed a three-pointer to give his team its largest lead of the game, 67–60. The Big Blue faithful began to drown out any hope of an A&M rally. With Texas A&M trailing 71–66 with 1:43 to play, guard Danuel House scored the final five points of regulation, including a tying jumper with 19 ticks left. Kentucky’s Tyler Ulis clanked a potential game-winner as time expired to send the matchup to overtime, which sparked a feeling of SEC déjà vu. On Feb. 20, Texas A&M beat Kentucky, 79–77, in overtime in College Station. That loss ultimately cost Kentucky a No. 1 seed in the SEC tournament, and Sunday’s game was a chance for the Wildcats to exact some revenge. And they did so with two of the biggest shots of their season. First, a clutch three-pointer from Derek Willis broke a 75–75 tie with 1:01 to play in overtime. One possession later, Murray delivered a true dagger: A last-ditch, pull-up three near the end of the shot clock. Murray’s shot pushed Kentucky ahead 81–75 with 15 seconds remaining, and as the freshman joyously backpedaled down the court, he launched—what else?—another make-believe arrow in the direction of the Wildcats’ bench. Murray, along with a top-tier effort from SEC player of the year Ulis (30 points, five assists), kept Kentucky from heading into Selection Sunday with a sour taste in its mouth. That journey has looked radically different than last season, when perfection was a legitimate goal for the Wildcats. This year, Kentucky looked shockingly un-Kentucky-like in nonconference losses to Ohio State and UCLA, as well as head-scratching setbacks against Auburn, Tennessee and LSU in SEC play. Highly touted freshman Skal Labissiere spent much of the year struggling to live up to his five-star rating. Meanwhile, the departure of seven players to the NBA draft seemingly shook the Wildcats’ once-proud chemistry. An inconsistent Kentucky squad, one that could hardly match last year’s suffocating defense, often looked the part of a conference pretender. None of that seemed to matter in Nashville on Sunday. That’s where Kentucky players basked in a locker-room celebration on the ground floor of Bridgestone Arena. They posed for selfies with the SEC championship trophy, pieces of basketball net hanging from their hats. The biggest piece of net hung from the neck of Isaiah Briscoe, a flashy freshman guard who scored 10 points against Texas A&M. Briscoe remains unfamiliar with the heartbreak of losing in tournament play, but as his teammates celebrated around him, he seemed to recognize what lies ahead for Kentucky. “We just need to take this momentum and go game-by-game,” Briscoe said. Kentucky, which earned a No. 4 seed in the East region in the NCAA tournament and will face No. 13 Stony Brook, used the SEC tourney to put its lackluster regular season behind it. Now the Cats have a chance to re-write that script in the Big Dance. And if they perform like they did in Nashville, Murray had better pack plenty of arrows.